I haven’t been a DC constant reader since the conclusion of Blackest Night. I hadn’t bought an individual monthly from DC since Flashpoint: Knight of Vengeance. I haven’t stepped foot in the DC comics universe since those early New 52 titles because they rubbed me the wrong way at every opportunity. Sure enough, though, if anything was going to bring me back, it was Green Lantern. Based on the promos I’d seen around the shops, I thought it was a fair assumption that Edge of Oblivion was a relatively isolated stand-alone series. Spoiler: it’s not. The lesson I’m learning here is that it isn’t easy to walk away from Marvel and DC and expect to be able ease back in later. Green Lantern Corps: Edge of Oblivion #1 cover. 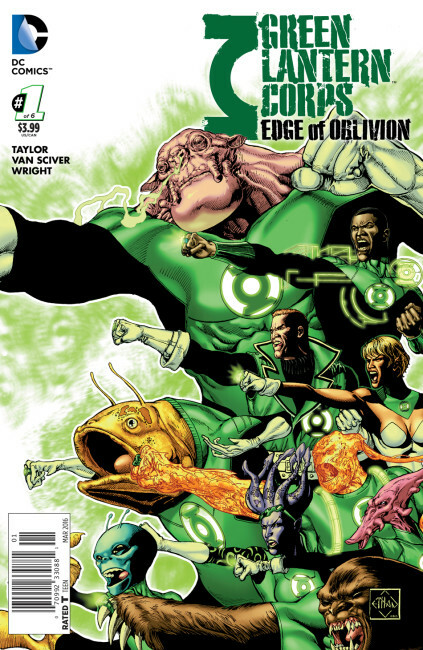 Picking up where Green Lantern: Lost Army left off, Edge of Oblivion opens to find a small troop of Green Lanterns lost in space and time. Some of the regulars are there — John Stewart, Guy Gardener, Simon Baz, Arisia, Mogo — as well as a host of second-stringers — B’dg, Galius Zed, and others. Here’s where three or four years of floppy book jet lag comes in. How did Gardener leave the Red Lanterns? Where is Kyle Rayner? Where are these guys and why are they so lost? Beats me. Want answers? Better shell out a couple hundred dollars to get the last four years of Green Lantern and Green Lantern Corps comics. Long story short, though, following the events of Lost Army, a few of our boys in green are teleported through space and time into a dying universe — the universe that immediately predates our own. Of course, along the way the Lanterns meet some friends as well as some enemies. It’s not entirely sure which is which just yet. A couple of crony cult members in red robes stand in the shadows and chatter while a pair of thirty-foot-tall behemoths with the evilest face paint I’ve seen this side of an Emperor album cover charge at Mogo absolutely unprovoked. Which is which? Only time will tell, I guess. One thing is for certain, though. Per usual, the Green Lanterns are having a tough time agreeing with anyone. For the sake of ease, John Stewart steps into the defacto leadership position while Guy Gardener mouths off in the distance. Then again, this group dynamic is also what’s made Green Lantern comics so interesting in the past. 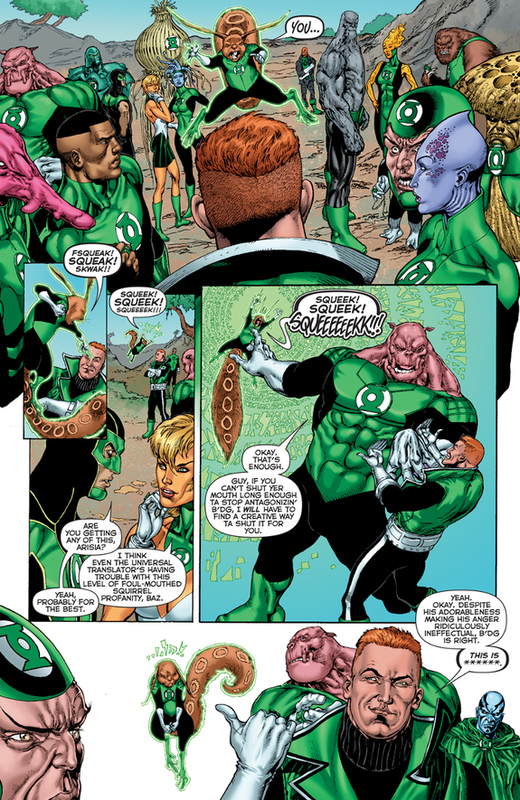 A page from Green Lantern Corps: Edge of Oblivion #1. Ethan Van Sciver, Green Lantern mainstay and Geoff Johns confidante, is on point as usual. A veteran Green Lantern illustrator, Sciver is no stranger to these characters and he handles them like a pro. Certain panels tend to get a bit crowded — what can you expect with so many big personalities all fighting for a little bit of page space all at once — but Van Sciver manages to maintain the balance at every turn. When it comes to Green Lantern, Van Sciver is second only to Ivan Reis, who made Blackest Night the visual spectacular it was. On the writing end, Tom Taylor carefully sets up the opening chapter of what surely promises to be an intriguing and mysterious bout in unknown space. From the first panel, Taylor is hard at work defining the voices of the characters under his charge — the only semblance of definition we get in the opening pages of this comic. Once all of the primaries are established, Taylor kicks the action into gear, introducing the new faces and posing the situation that will eventually evolve into the Lanterns’ battleground. If we’re being perfectly honest here, this is one of the better Green Lantern books I’ve read. In the ol’ “cons” column, the only thing I can list is the lack of newcomer Simon Baz, who is demoted down to a face in the background, and DC’s casual tendency to not preface their new series whatsoever. Besides that, though the rest of the book — from the plot to the art — as about as perfect as one can hope for.